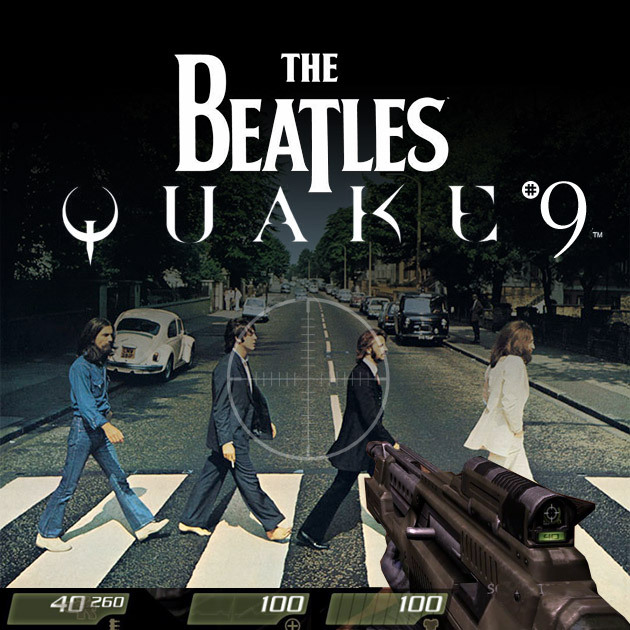 Photo Credit: The Beatles Quake #9. My recommendation for the next Beatles Video Game. I used to like The Beatles. I mean, I never loved them. My first direct encounter with them was a high school friend, Sean, singing their praises every chance he got, replying to my dismissals of repetitive, dated, jingle-sounding ditties with “then why are they the best selling band of all time?” exclamations. Most of their songs (“Paperback Writer”, “Blackbird”, the entire “Sergeant Pepper…” album, etc.) I hate with a passion. However, over the last decade — since Sean’s proselytizing — I’d grown to tolerate a handful of their songs and actually like a few (David Cook’s rendition of “Eleanor Rigby“, Alanis Morrisette’s live “Dear Prudence“). This is no more. The recent death of Michael Jackson (and the sale of his rights to their music), the recent concerts by Sir Paul McCartney, the sale of “The Beatles’ Remastered” collection, the release of The Beatles’ Rockband and the “Mono” boxset (the 13 CD set that is currently/still out-of-stock at Amazon.com) have put the final nail in the coffin of my Beatles tolerance. The guise has been lifted and whatever respect I had for the remaining members as people and artists is no longer. The over-saturation has presented their canon as a corporate money-making machine and, worse, exposed how formulaic and near-identical their songs actually are. I’ve joined the ranks of Starbucks boycotters, but may be the only disgruntled ex-customer to do so ONLY because I cannot stand their endless repeating of Beatles songs (I happen to believe them when they say they’re fair trade, good to employees, and provide a service different from local non-franchised cafés). Last Saturday, my penultimate visit to the caffeine behemoth, I left after 45 minutes; enough time to hear “We Can Work it Out” three times. I walked in yesterday, temporarily forgetting my moratorium on patronage, was rudely re-awakened with the unsettling harmony of the walrus, and promptly exited before I could hear one “coo-coo cachoo”. 1. If you throw enough money to promote something (boxsets, collections, video games, whatever), people will unwittingly be tricked into not only BUYING something, but believing they actually like it. 2. There is no longer any direct correlation between album (or book, or movie, or whatever) sales and talent/quality products, only marketing dollars. Yes, I realize this is the same decree that conservatives shouted from the rooftops about the 2008 presidential campaign. No, I do not believe it applies. So thanks go to you: Sir Paul McCartney, Harmonix Music Systems, EA Distribution, MTV Games, Amazon.com, 104.3 FM, Starbucks, EMI and the partially rotting, mostly unbiodegradable corpse of Michael Jackson.Thank you for proving my instinctive reaction to The Beatles back in high school when I first told Sean they were crap. I firmly know now the answer to his question: millions and millions of marketing dollars. I was quite late to actually diving into the Beatles catalog myself, and while I can’t say I’m as die-hard a fan as others I know, I am certainly an admirer. I can appreciate the love-hate aspect, though. There was a point in time when I would have agreed with you that those left alive are selling their legacy to death, but the curmudgeon in me has come to accept that this is just the new reality of how music is monetized and disseminated. If you’re able to create something that people are still willing to pay for after all these years, then I can’t fault them for doing so. I only wish more artists were able to do so. And what’s more, their music is selling to the new generation on the quality of the music alone. I can say with some confidence this marketing push wouldn’t be there if there wasn’t still an audience for it. In this day and age, I find it hard to believe that anyone is buying remastered or reissued music unless they really want to. P.S. – Would love to see some of the sources you have for your points listed in the “This is no more” paragraph.